Books can share both your vision and how your products and services help customers reach that vision. 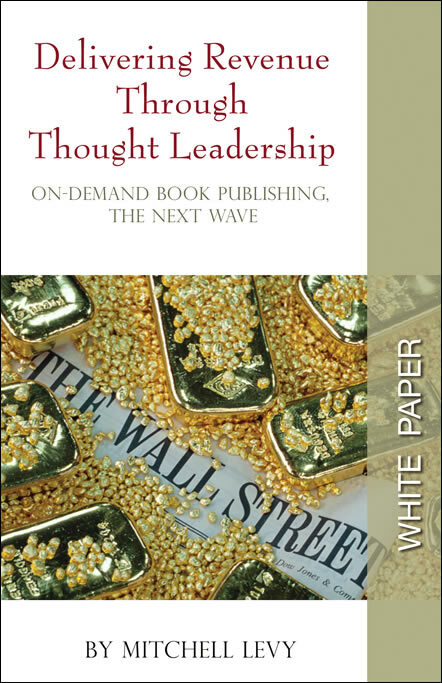 On-demand book publishing can quickly and easily help companies drive sales through thought leadership. \WHAT do you write about? Catherine Kitcho wrote a book called "High-Tech Product Launch" which sold 3,000 copies. 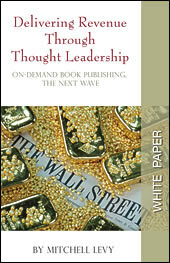 Indirect consulting revenue attributed directly to the book is over $200,000 and counting. "It's a gift. It's a guide. It's a chance to tell the whole story in a way that white papers only hope to achieve. It can take the time to tell the story instead of the bullet points and it's a tchotchke that people will not throw out --- a book has intrinsic value." How do you capture a prospects attention in a way that generates instant credibility? Simple: hand them a book thats relevant to them. Its amazing how much credibility is generated by a book, both for the author and for the content. These comments reflect the old world of publishing where it does take too long, costs too much, and requires artificially high sales rates to be considered successful. On-demand book publishing has changed the rules! The old world is one where it takes over 1,000 hours to write and 18-24 months for a publisher to bring a book to market. The new world is one where it takes 100-200 hours to write, and 3-4 months for an on-demand publisher to bring a book to market (quicker, if need be). The old world is one where successfully getting a book to market means that you sell over 5,000 copies. The new world is one where one book in the right prospects hand may define success. The old world is one where you write it yourself or hire and manage the ghostwriter. The new world is one where you hire a firm, like Quick2Publish, that writes and publishes the book for you. Mitchell Levy Author of six books and a frequent public speaker on strategic management, business trends and book publishing. He is the CEO and executive editor of Quick2Publish and its imprint Happy About®. He is also Director and Chief Strategy Officer of the Silicon Valley Executive Business Program, a partner of CXOnetworking and sits on the board of directors of Rainmaker Systems (NASDAQ: RMKR). Previously, he was the conference chair at four Comdex conferences, created four executive management programs (over 100 courses) at San Jose State University and University of California, Santa Cruz including the word reknown E-Commerce Management Program at San Jose State University and spent nine years at Sun Microsystems, the last four of which he ran the E-Commerce component of Sun's Supply Chain.